Small businesses should be wholly exempted, the tax money should be spent in line with a regional plan and an independent board should provide oversight, the mayor wrote in a letter to Seattle City Council members. 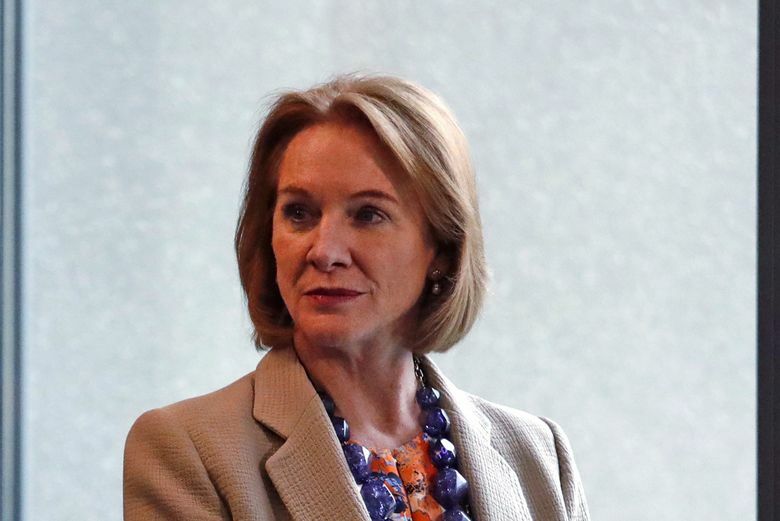 Seattle Mayor Jenny Durkan is willing to work with City Council members on a new tax on businesses to help address homelessness, she says, but she wants them to consider her views as they craft a measure that could raise tens of millions of dollars a year. Small businesses should be wholly exempted, the tax money should be spent in line with a regional plan on homelessness and an independent board should provide oversight, she wrote in a letter to the council’s nine members Tuesday, making her most specific comments to date on the issue. After staying on the sidelines for months, Durkan is weighing in at a key juncture. The council members championing the idea of a new tax on employers intend to release draft legislation in the coming days, following weeks of discussions. They need five votes to pass a measure. Six would override a mayoral veto. “We need solutions that improve lives but do not harm our economy,” Durkan wrote about the possibility of Seattle’s adopting a so-called employee “head tax,” as business people speaking before a council committee meeting Tuesday made similar points. “I look forward to working closely with each of you as we aim to ensure any proposal meets a robust legal challenge and can be fully and effectively implemented,” she added. The council members have been deliberating since last month, when they received a report from a task force of community members and advocates. Rather than say exactly which businesses should be taxed and how, the task force recommended several options and said the tax should raise $75 million per year. The tax could apply to all businesses or only larger businesses — though where to draw the line is up for debate. It could apply at different rates for businesses of different sizes, and certain kinds of businesses could be exempted. Also, the tax could be collected based on the number of hours worked by a company’s employees or by the size of a company’s payroll. In November, the council narrowly rejected a tax of 6.5 cents per employee hour on businesses grossing more than $10 million per year. It would have raised $25 million annually. On Tuesday, some business people told council members they would prefer a payroll tax to an employee-hours tax. “The size, scope and impacts of any proposal must be gauged correctly,” wrote Durkan, supported by Amazon and other leading companies in her mayoral campaign last year. Though the council members pushing for a new tax have consistently expressed a desire to target Seattle’s largest businesses, such as Amazon, Durkan has repeatedly cited worries about small businesses in withholding support for the idea. Some business people were alarmed when the task force suggested the council might want to impose a flat “skin in the game” tax of a few hundred dollars on small companies, rather than completely exempting them. The council should reject that option and should also exempt nonprofits, member organizations and health-care providers, Durkan wrote. There should be tax breaks for companies that make private investments in homeless services and affordable housing, and a board appointed by the council and mayor should oversee how the money is spent, she added. Parts of the mayor’s letter echoed statements by business people at a roundtable discussion in the council’s finance committee. Though the city is undergoing a tech-powered boom, some small companies are barely hanging on, the owners of stores in Wallingford and Pike Place Market said, asking to be spared. Councilmember Kshama Sawant showed less concern for Safeway, after a representative warned a tax would be passed on to shoppers in the form of higher prices and could contribute to people going hungry. Profit margins in the supermarket industry are small, said Sara Osborne, a regional government-relations director. “I don’t support this tax landing on small businesses at all,” but Safeway’s parent company, Albertsons, is one of the country’s largest private businesses, Sawant said.